little bee books, 9781499805970, 14pp. 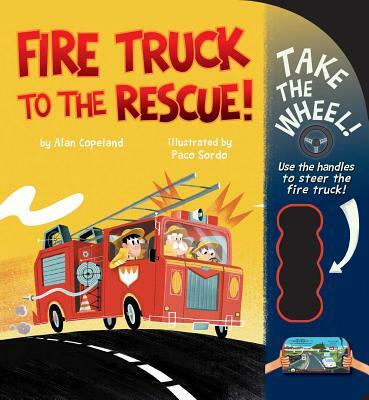 Grab hold of this book that lets you steer a fire truck to the rescue! Can you see the fire in the distance? Hmm . . . we're going a bit too slow. Steer us into the right lane so we can get there faster! Put on your seatbelt and your helmet-it's time to drive a fire truck! Kids will love using the die-cut handles in this novelty board book to control the fire truck and steer through the country and city around animals, cars, and traffic to put out the fire! Alan Copeland is a children's book author and editor in New York City. Paco Sordo is a comics artist, animator, storyboarder, and background artist based in Spain. He has done work for advertising, magazines, newspapers, and TV--including Nickelodeon. Visit him online at pacosordo.com.